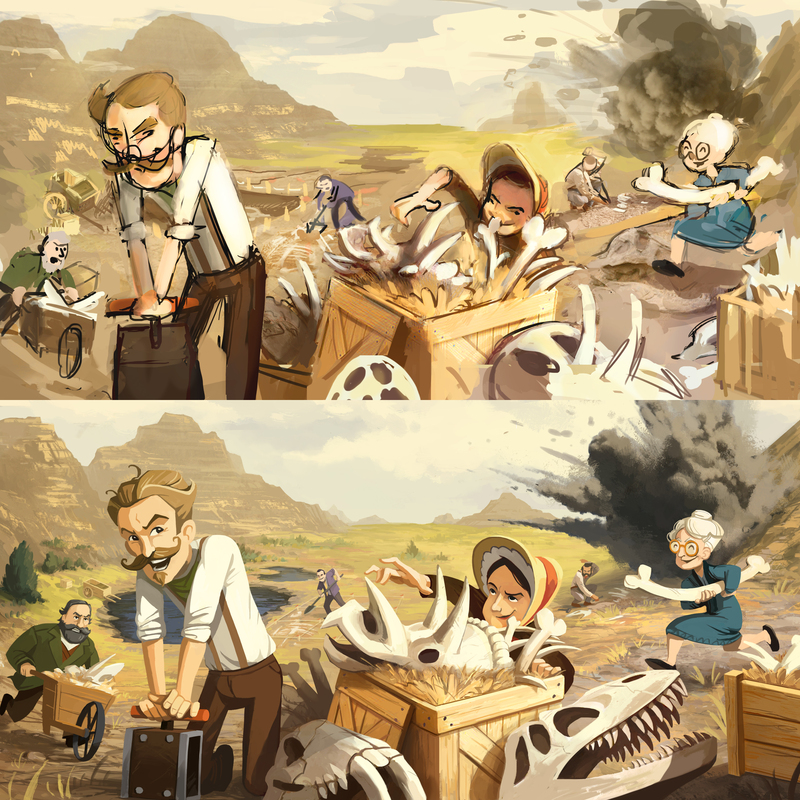 When we recently awarded a golden hook to the Great Dinosaur Rush by Ape games I really loved the art. Its a great dust digging color scheme and cute characters that capture the Archeology and Palaeontology feeling in it’s essence. Actually we see the game is released on TableTopia – the online board game platform we recently made a special label for. The artist behind Bone Wars (which some call it) is Mr. Cuddington – that is one cool name that made me curious. GreenHookGames are happy to serve you this interview with Mr. Cuddington. Its a peek under the coat that, as some may know, reveals not one but two persons! 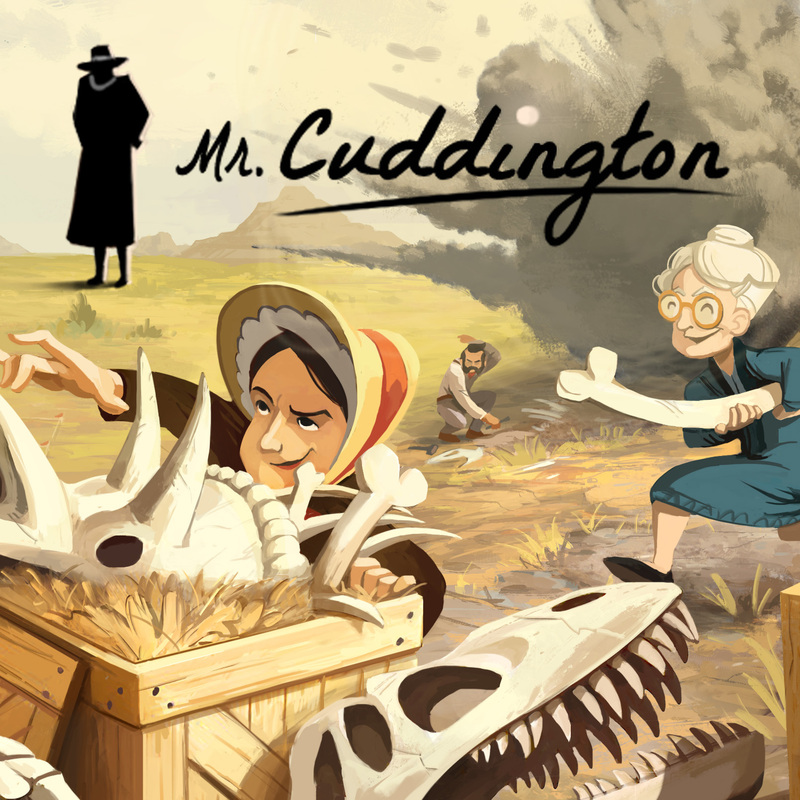 Mr. Cuddington is your artistic pen name – what is the real names hiding behind the coat and where are you from? Mr. Cuddington is the combined work of both me, Lina Cossette, and my husband, David Forest. We specialize in illustrations for board games, which also happens to be a passion of ours. We recently moved and started working from our lovely little house in Warwick, Québec, Canada. David and I always felt like we could tell what the other was thinking, and we often joked about being but one person. When it came time to find name for our studio, we thought it would be fun to create a single character to represent us. That’s how we came up with this sort of british-sounding gentleman called Mr. Cuddington, who if you look closely behind the tall peculiar facade, is really just both of us hiding one atop of the other under the same coat like children playing with grown-up clothes. Could you tell us a little about how you ended up working together? Well, me and David both graduated from the same college in the animation field. He did the 3D animation program while I did the traditional hand drawn animation. We both got jobs in animation and video game studios afterwards. I was an animator for a while then switched to be a 2D artist for mobile games. David worked as an animator for a couple of years then he and two of his friends directed a short film called Le Gouffre. When the short film was done, we felt like it would be a good time to take a leap of faith and give the board game industry a try. We had wanted to work side by side for quite some time and we both had strengths that complemented each other well so we were confident that we could do a wide range of styles and projects together. Since 2013 you have already worked on several board game titles together. Fantastic work on titles like “The Great Dinosaur Rush”, Woodlands, 12 days to Christmas. But also recently on the Unpublished “Unfair” by Joel Finch. 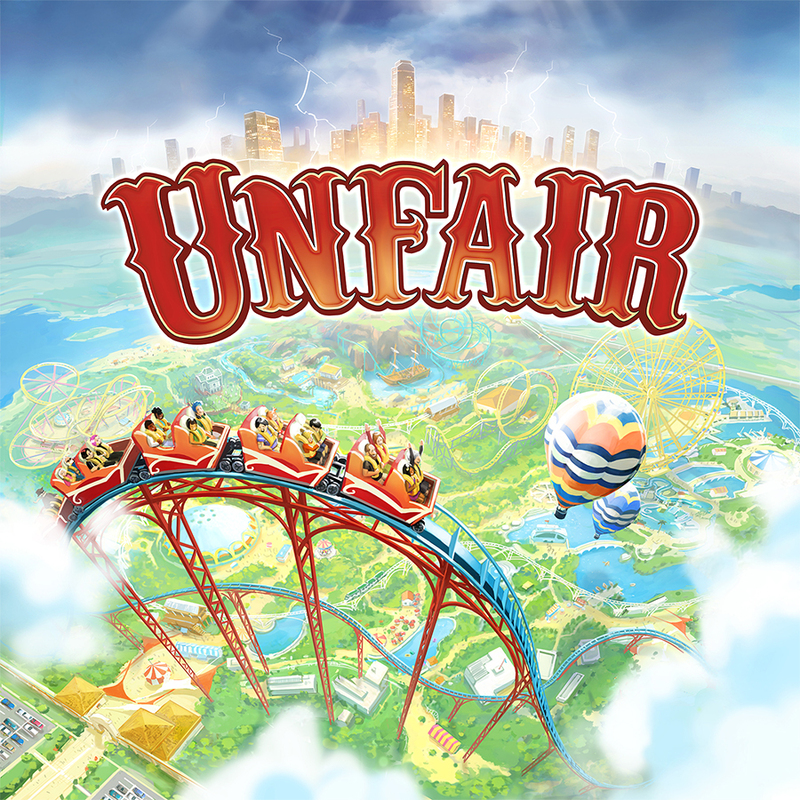 Did you also make the Graphic design on the Unfair cards? Thanks! We are very happy to have been a part of all those games. We helped Joel make some of the elements for the graphic design like the icons and the ribbons, but he did a good part of it by himself. 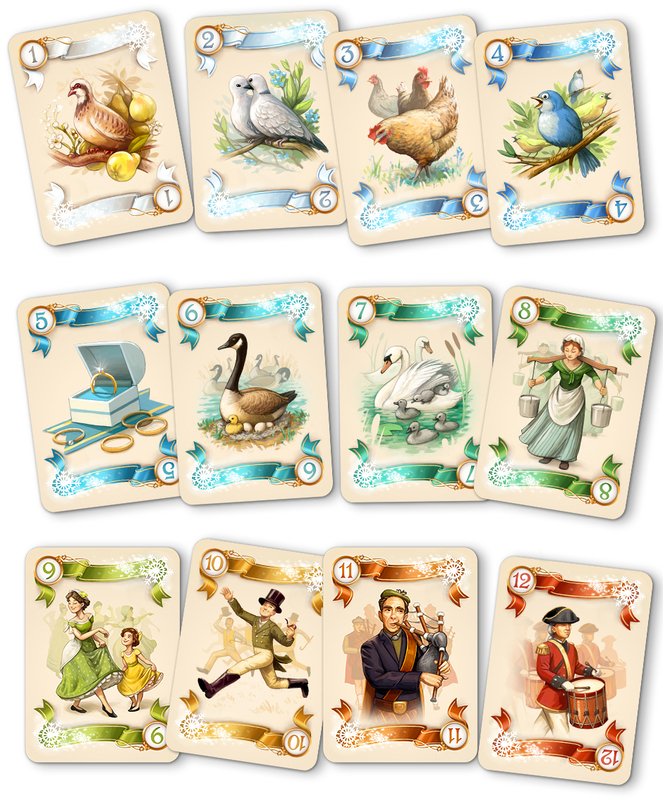 In fact, he just recently changed the layout of the cards to full-bleed illustrations and it looks great! Do you always work on the same project and how do you divide the work between you? Most of the time, we will both work on the images but not at the same time. I could be working on a sketch for a character and then David would clean it or vice versa. But even then we will ask one another for approval or ideas all along the way. I would say that pretty much everything has a touch of the both of us. I would say that pretty much everything has a touch of the both of us. And the more we work together the easier it gets to merge our styles and work as one. What would you say are your individual strengths? I think that David understands light better than I do, so most of the time he will be doing a final pass of details at the very end before sending a final image. Environments are his strong suit and he also knows 3D which is helpful for some projects we are working on at the moment. As for me, I usually do a lot of the initial sketching and character work. How is the perfect brief on a job – in your opinion? It’s hard to say. The perfect brief can be so many things. Some clients have very clear ideas of what they want while some others give us a lot of latitude – both approaches can be great. Keeping strong communication all throughout the project is probably equally if not more important than the actual brief. We’re always open to change things up dramatically if our sketches are not quite right so we’re not so stressed about getting everything pinned down right from the start. Keeping strong communication all throughout the project is probably equally if not more important than the actual brief. How often are you involved in the game mechanics of the games? Not very often. For the most part, games are already pretty close to final when people contact us. But it’s always nice to be able to help improve a game and we do love to receive prototypes and give our opinion when we can. Things shifted quite a lot from the initial idea. Is it safe to say that you work very methodically – It seems like you have thoroughly sketched an illustration before coloring. Could you roughly describe your workflow on your game illustrations. From start to the final image? We usually begin with a very rough sketch to start the discussion between the two of us. We brainstorm and comment on that , then one of us continues with the sketch. The great thing about being two people working on the same illustration is there’s always one of us who has a fresh eye on the project and we can constantly bounce ideas off one another. 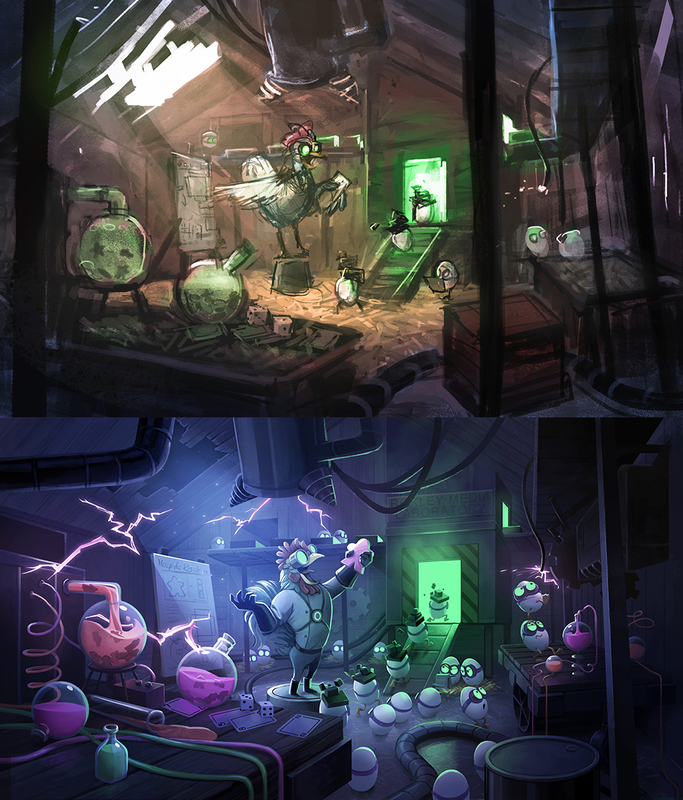 Normally the first sketch we send to the client is relatively advanced in the sense that it already has a color palette and rough pass of lighting. We find it’s sometimes difficult for the client to comment on sketchy black and white image so we prefer to have a bit more work done before sending it. We then discuss the sketch with the client and redo stuff if needed until we have a sketch that everyone is happy with. From there we work on refining the image until it’s completed and ready to send for client approval. 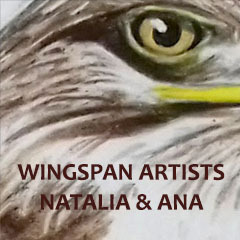 We pretty much only paint with Photoshop and we both work with a Wacom tablet. I think it’s important to take the time to understand the game you are illustrating. Reading the rules or at least have an overview of how the game is played will help making the right decisions, especially for the graphic design. It’s important that the information the card (or else) is there to convey is clear and has enough space to breathe. You want the art to showcase the information so that it does not impair the gameplay. How do you choose colors for your art? It’s usually a very intuitive process but sometimes the projects call for certain colors in particular. Things like the theme and mood of the game, as well as the intended audience, will give us a cue on the kind of colors that might work better than others. I am more intuitive and David more meticulous. We both work with a lot of layers but David’s PSDs tend to be cleaner. He uses layer comps a lot while I tend to prefer using folders to organise my layers. We normally save a lot of PSD increments along the way so that we can look back on earlier versions. Can you say an approximate number of brushes you normally use on one piece of art? It sure depends on the style we are going for but it can range from around 3 to 10 brushes per piece of art. 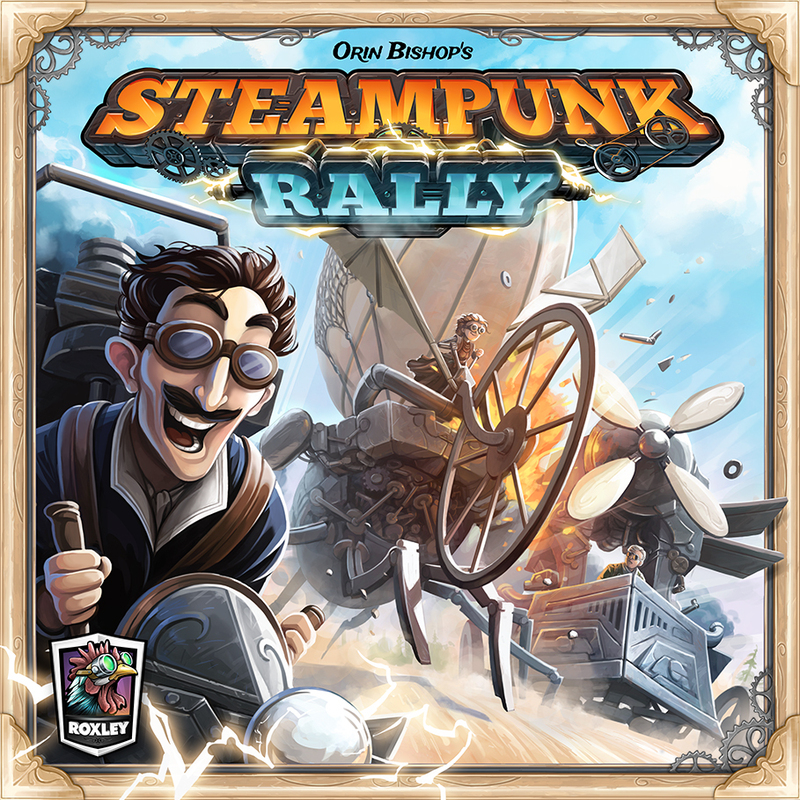 Hum there is still a lot of images we can’t show because the games are not public yet, but we really like the covers we did for both Unfair and Steampunk Rally. We’re also very fond of the illustrations we did for 12 Days of Christmas. Who of you is the most crazy? Depends on what you mean by crazy! We are both very calm and moderate but I would say David is the one who tends to be obsessing with details. No craziness… ,) Then who are your own favourite artists out there? Board game related, I would say Naïade (Xavier Gueniffey Durin) – click to read the interview, Paul Mafayon and Mathieu Leyssenne come to mind. We also have many favorite non-board game related artists like Oga Kazuo, Charlie Bowater, Cecile Carre and Cedric Peyravernay. But there are so many talented and inspiring artists out there, we could go on and on! Do you play board games together and do you have a common favorite game? We pretty much always play board games with one another. It’s difficult to pick just one game but I would say that Seasons and Innovation are two games that we both enjoy playing quite a lot. With a one year old baby, time is often a rare resource so we tend to prefer faster-paced card games which we can keep under 30-40 minutes of play. Simply searching ”character design reference” on Pinterest will get you a very large and inspiring collection of galleries and tutorials ranging from anatomy to environments to historical clothing. It’s very well organised and diversified and it’s definitely worth a look. We certainly agree with pinterest as a tool for inspiration and mood boarding (5 valuable tools). Thank you David and Lina – Mr. Cuddington for your time so close to Christmas. We hope to see more of your fantastic work and wish your family and baby peace and happiness. You can now follow GHG on G+ for convenient notifications on our best articles.